There're just electrical switches - but bloody useful ones! 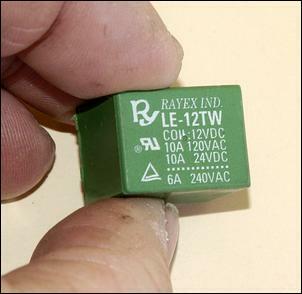 In any electrical system, relays are amongst the most useful of components. They let you control heavy loads with light-weight switches, allow one device to be switched off at the same time as another is switched on, are very hard to blow-up, and are cheap and widely available. That’s a damn good list of attributes! 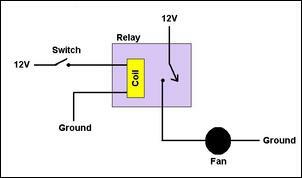 A relay is just a small switch whose movement is caused by the action of an electromagnet inside. When power is applied to the relay’s coil, the electromagnet comes alive and pulls across the switching contacts. The simplest relay is a single pole, single throw (SPST) design. This designation refers to the switching part of the relay where when it's activated, one wire (a "single pole") can be connected only one way (a "single throw"). Just like an on/off switch, when you power up the relay's coil, the connection is made; when you unpower the coil, the connection is broken. 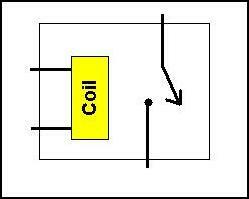 In this diagram the relay's coil is yellow. Near to the coil you can see a switch, which is open. This is called a Normally Open contact - it's open when there's no power being applied to the relay. 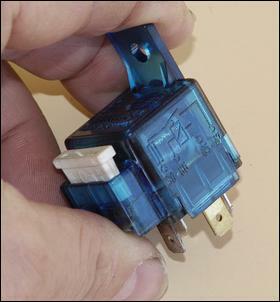 When power is applied to the relay’s coil, the single contact closes. This is a Single Pole Single Throw relay - SPST. SPST relays have four terminals - two are to power the coil and the other two are the connections for the internal switch. 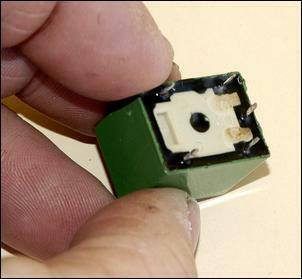 As you can see, there is no electrical connection between the pair of contacts for the coil and the pair of contacts for the switching side of the relay. On automotive SPST relays, the pins are given standardised numbers. The coil connections are 85 and 86, while the two connections for the internal switch are 30 and 87. However, most general purpose relays don’t have any numbers on the pins – instead the functions of the pins are shown on a little diagram on the body of the relay. The most common use for a SPST relay is to use a small electrical current to control a large electrical current. For example, a radiator fan might be triggered by a temperature switch. The temp switch is capable of flowing only 2 amps, but the radiator fan at switch-on takes 15 amps (and then settles back to 8 amps continuous). If you wire the radiator fan to the switch like this, after a few weeks the switch would fail – its contacts are being hugely overloaded. The solution is to add a SPST relay that is wired into the circuit like this. 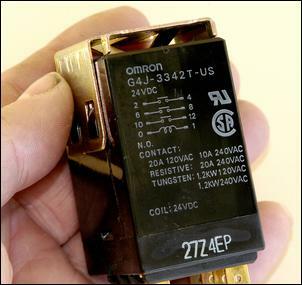 Neither the relay coil nor the switching part of the relay have polarities – both can be connected either way around to 12V and Ground. As we said earlier, a relay is very hard to blow-up! But wouldn't it be good if we had a contact that was broken at the same time as the switch was made? That's what happens in the Single Pole, Double Throw design. Another contact has been added that is Normally Closed. When the relay is energised, this contact is broken and the other one (the Normally Open contact) is closed. We still have only a single pole to be switched, but now it can be connected two ways - a double throw design. This type of relay is therefore called a Single Pole, Double Throw relay. As you can see, it has both Normally Open (NO) and Normally Closed (NC) contacts. Some people call this a changeover relay. A SPDT relay allows you to control two devices, switching one off as the other is switched on. A recent example of where I needed to use a relay in this way is in a fuel system that needed to be switched between two different fuel pressures. To raise the fuel pressure, a solenoid valve had to be turned off and at the same time, a fuel pump needed to be switched on. 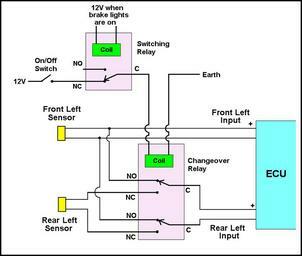 Both devices draw a fair amount of current so a heavy duty automotive relay was used. SPDT automotive relays use the following codes for their pins: the coil connections are again 85 and 86, the normally closed output is 87a, the normally open output is 87 and the input is 30. The circuit diagram for the fuel system relay looks like this. 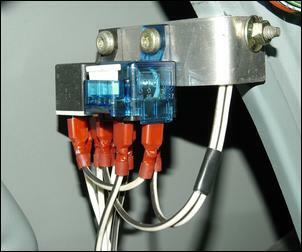 Power is normally supplied to the solenoid through the Normally Closed (NC) relay contact, energising the solenoid. But when the relay’s coil is activated (by closing the High/Low Fuel Pressure switch), the relay pulls the contact across, switching off the solenoid and switching on the fuel pump. The High/Low Fuel Pressure switch has to handle only enough current to switch the relay’s coil, so this can be a light-duty switch (eg a boost pressure switch or a microswitch). These relays are less common in automotive aftermarket use and so don’t have coded numbers for the pins. Using a relay is made a lot simpler if you follow these steps. 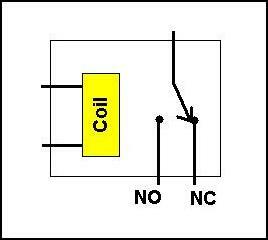 Draw a circuit diagram. The first step is to draw a simple circuit diagram showing where the wires go. Which wires go to the relay coil, which to the Normally Open and Normally Closed contacts of the relay? Decide what type of relay is needed. If just one connection needs to be switched on and off, you’ll use a SPST design. If two connections need to be switched, a DPST or (more commonly) a DPDT design will be the one to use. A changeover (where one device is switched off and the other switched on) can use a SPDT or a DPDT design. Wire the relay coil first. If you wire the relay’s coil first, you’ll be able to check that the relay is working by listening to its click. It’s easy to think of relays as being suitable for just simple car modifications, but that’s not always the case. 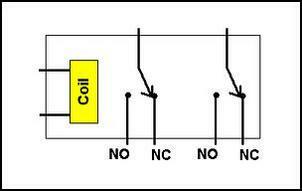 This circuit shows the use of two relays that deactivate traction control without affecting ABS or stability control. The system works by connecting the un-driven wheel ABS sensor outputs to the driven wheel ECU inputs, so that the ECU cannot see a speed difference between the undriven and driven wheels. The modification is automatically switched off whenever the brakes are applied, or by a manual on/off switch. This diagram shows only half of the system - the complete the system just mirror-images the wiring for the other side of the car. In addition to its contact configuration (SPST, DPDT, etc) there are at least three other specifications that are important. This spec refers to the max current that a relay’s contacts can handle. To avoid arcing, you should use a factor of safety where the max current of your switched circuit (even when it first switches on with a current gulp) is less than the relay’s spec. Automotive relays are available with current ratings like 25, 30 and even 60 amps. Be careful when checking max current specs that the listing is for the DC at or above the voltage you’ll be using – ie, in cars, 13.8V. For example, a relay rated at 10 amps at 240V AC is not the same as one rated at 10 amps at 12V DC. Other specs that you might fine listed include life (ie how many millions of operations the relay will do before failure) and perhaps response time. 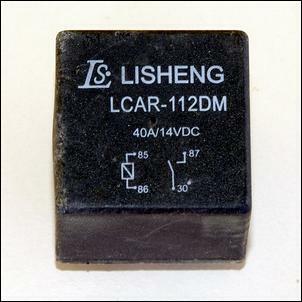 Relays can be useful in nearly every electrical or electronic car modification. Get your head around their use and you’ll never regret having spent the time to find out how they can be used.